Of all the powers Superman boasts, the two most appealing to many of us are the power of flight and X-ray vision. While the power of flight is not likely to happen without an airplane, the superhuman vision may be just around the corner. Engineers from the University of Washington (UW) used advanced manufacturing techniques to combine a flexible and safe contact lens suitable to be worn on the eye like any other contact lens with imprinted electronic circuits and lights. 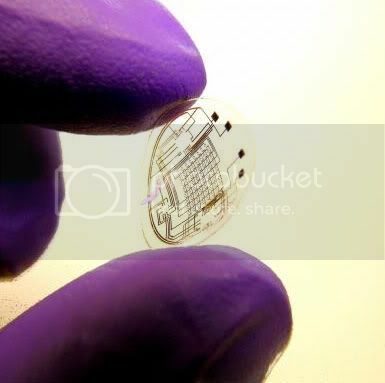 The uses for such wearable contact lens displays are many from simple heads up displays while driving in your car or piloting a plane to complex systems for soldiers making the world through a soldiers eyes more like the view from a current video game. 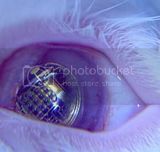 A prototype lens was constructed that contains an electronic circuit as well as red LED lights for a display. The catch with the prototype is that the LEDs don’t light up. The researchers put the contact lens into the eyes of rabbits in animal testing for periods of up to 20 minutes without any side effects for the animals. The researchers plan to eventually power the lenses using a combination of radio frequency power and solar cells placed on the lens according to Parviz. The large portion of the eye outside the transparent portion of the eye could be used to place the required electronics. The prototype lens was constructed using circuits built from layers of metal only a few nanometers thick and about one thousandth the width of a human hair. A powder of electrical components was then sprinkled onto a flexible plastic sheet and capillary forces combined with the design of the electrical components in the powder being built to only connect one way constructs the components via self-assembly.